One of my favourite nail art Instagram accounts is @robin020226. I'm not usually a massive fan of Japanese nail art as there is a lot of bling and nail studs etc. Robin's nail art is completely different and I'm totally in love with it! This mani is inspired by one of Robin's more simple designs (there was no way I could recreate the Disney characters or Marilyn Monroe!). I loved the beautiful simplicity of the black outline flowers contrasting with a bright summery colour. I used all Barry M polishes and nail pens for this design. Robin used pinks for her design but I was in a coral mood so went for Papaya. I love how well it works with the summery flowers. For the flowers I dabbed on a thin circle of Lemon Ice Cream using a cotton bud. Inside this I added a smaller area of Strawberry Ice Cream and blended the two as much as possible. 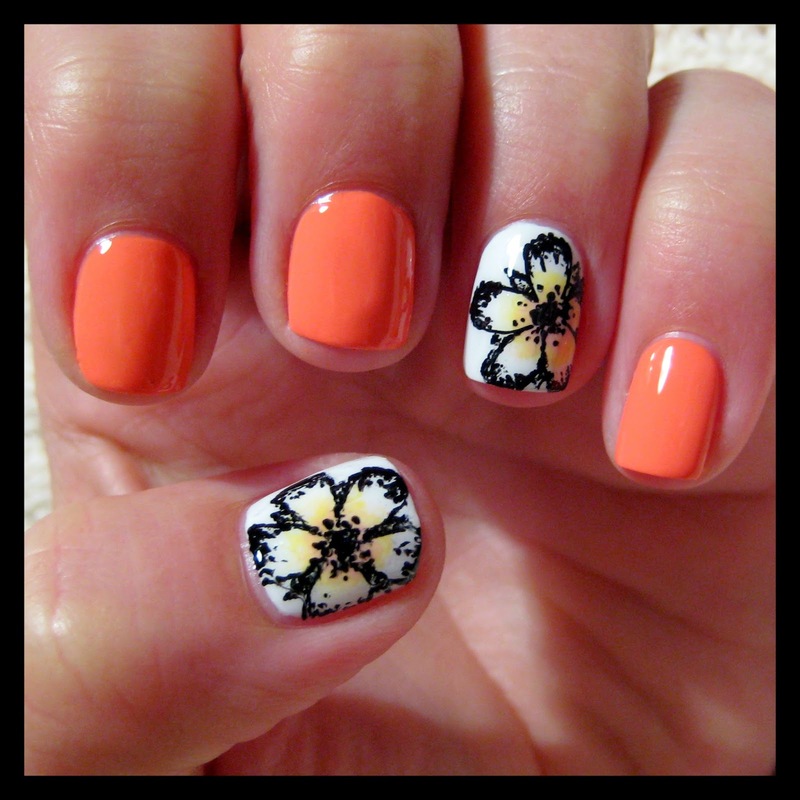 To draw the flowers I used my Barry M nail art pen, drawing on a rough outline and then adding the detail. They weren't meant to be too neat, but I was a little disappointed with how they came out as they look a little messier than intended. My petals weren't very even so I added some extra little leaves/small petals in between them to even them out which helped a little. The coloured centres of the flowers look so cute and were super easy to do, so I think I will try that again but maybe incorporating it into a different design. This was quite a quick and simply mani which didn't need much drying time or special tools. Perhaps I should have taken a little longer over it to achieve the detail I wanted, a lesson learnt! I think the flowers look amazing! I love the kind of messy vibe they have, and the centres are perfect! What an amazing Insta account too.